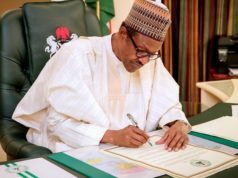 President Muhammadu Buhari on Friday said he had no objections to any plan by the police to arrest Senate President Bukola Saraki over a string of murder cases in Kwara State. The president received Inspector-General Ibrahim Idris at the State House on Friday afternoon, during which he was told of at least 20 murders allegedly linked to Mr Saraki in his home state, according to multiple sources briefed of the meeting. Sources said the police chief arrived at the State House with a cornucopia of homicide investigation documents relating to Mr Saraki. The top lawmaker could be arrested any day from now following the president’s position that the law should run its course insofar as detectives have sufficient facts to file charges. Already, the police have declared Mr Saraki a person of interest in the deadly robbery incident in Offa, the second-largest settlement in Kwara State. The police said at least 17 persons, including nine police officers, were killed and five banks raided in the April 5 attack. The police said the death toll from the robbery has risen steadily to 33 as at last week. Twenty 22 suspects, including a dismissed police sergeant, have been announced arrested. Mr Saraki was amongst the first set of leaders to condemn the attack and called for a sweeping investigation and prosecution of all suspects. In a statement on Sunday, police spokesperson, Jimoh Moshood, said at least five of the suspects arrested in the robbery “admitted and confessed to have been sponsored with firearms, money and operational vehicles” by Mr Saraki and Abdulfatah Ahmed, the state governor. While parading the suspects on Sunday afternoon, Mr Moshood identified one of them as Ayoade Akinnibosun, a 37 years old resident of the state and the ‘overall’ leader of the armed gang. His vehicle was allegedly one of those used in the robbery. A number plate allegedly registered in Mr Akinnibosun’s name superimposed on a sticker number plate which had ‘SARAKI’ boldly written on it. Amongst top Kwara government officials named in the robbery were Yusuf Abdulwahab, the chief of staff to the governor, and the environment commissioner. The police said Mr Abdulwahab, 58, had been taken into custody, but it was not immediately clear whether it was in connection to the robbery. Some local news reports out of Kwara said Mr Abdulwahab was arrested on fraud charges unrelated to the robbery two days ago. Mr Sakari has been asked to turn himself in at the police intelligence department in Guzape, Abuja. No date was specified for the summon. The Senate President could be arrested if he fails to turn himself in as demanded by the police, especially as he enjoys no immunity from prosecution. But Mr Ahmed, whose position as governor accords him absolute immunity from criminal charges, has denied the police claims against him. The governor said he had never been involved in or encouraged “thuggery or any other form of criminality.” He said the state government provided funds for youth in the state for small businesses; but neither him nor the state government should be held responsible for how the youth use such funds. On his part, it was not immediately clear whether the Senate President will honour the invitation. His spokesperson, Yusuph Olaniyonu, Sunday afternoon did not return reporters telephone calls and text messages seeking comments about the police invitation and Mr Buhari’s approval. 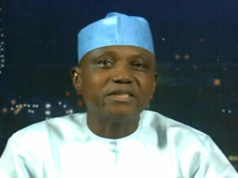 Presidential spokespersons, Femi Adesina and Garba Shehu, did not return multiple requests for comments. Neither did Mr Moshood answer enquiries about Mr Idris’ visit to the State House and the invitation to Mr Saraki. The disclosure that Mr Saraki had been implicated in murder cases comes three weeks after an open confrontation played out between the police and the top lawmaker. But the confrontation was over separate criminal suspects arrested in connection to multiple gang killings the state over the past two years. The police abruptly moved the suspects to Abuja after the were arrested in Kwara and charges were being prepared against them over there. On May 16, the day the police transferred the suspects, Mr Saraki alerted the nation of an alleged plan by Mr Idris and his police team to implicate him in criminal matters. The top lawmaker told the Senate plenary that Mr Ahmed informed him the suspects were being transferred to Abuja to ease the alleged sinister plot by the police. The police fiercely rejected the claim in a statement the same day, reprimanding Mr Saraki for his conduct and warning to desist from compromising an ongoing criminal investigation. Judicial authorities in Kwara asked the police to return the suspects to the state for trial because their charges had already been prepared, a demand that hit a brick wall with the police. There were initial reports that the suspects, some of whom Journalists later found were suspected cultists, confessed they were sponsored by Mr Saraki, but the Kwara government swiftly debunked the claims, insisting that the suspects did not indict anyone. Neither the 22 suspects arrested in the Offa robbery nor the murder suspects in cultist clashes have been charged to court. The police earlier stated that they would charge all the suspects upon conclusion of preliminary investigations. It was not immediately clear how the police arrived at the 20 murders reportedly linked to Mr Saraki when they confirmed 33 deaths in the Offa robbery incident alone. But his arrest, notwithstanding the severity, could prove politically toxic for the ruling All Progressives Congress (APC), said political analyst, Sola Olubanjo. When Mr Saraki first alleged attempt to frame him up on May 16, the Senate constituted a nine-member emissary to appeal to Mr Buhari to prevail on Mr Idris to relax criminal allegations against the top lawmaker. Mr Saraki has also been leading a pack of politicians who allege marginalisation within the APC. The politicians, under the so-called nPDP, hold individual grudges, which range from alleged marginalisation over the past three years to their future standing within the ruling party. Last week, the members met with Vice President Yemi Osinbajo at the State House, but details of their discussion were not immediately disclosed. Mr Buhari was not a part of the meeting, but there was optimism amongst the nPDP members that they would still meet the president. Bolaji Abdullahi, the national spokesperson for the APC, did not immediately return Journlists’ calls seeking comments about the political fallout of Mr Saraki’s run-in with federal authorities. 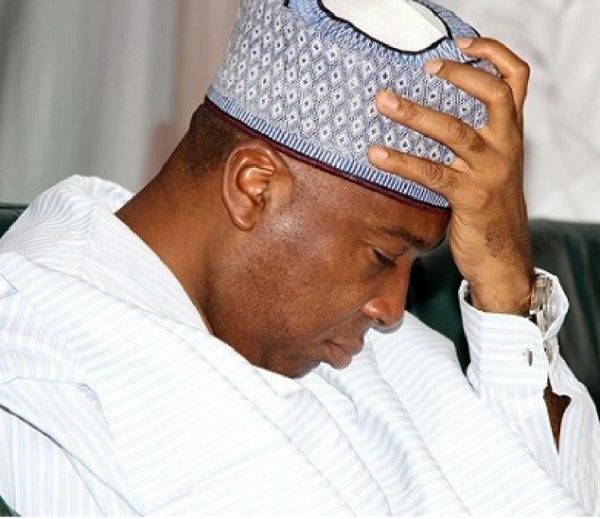 A media consultant for the party who spoke with Journalists said he would not be able to immediately quantify how devastating it would be for the APC if Mr Saraki is arrested. “Arresting the Senate President could thwart the ongoing reconciliation efforts and that may not be good for the party,” Mr Akanji added. If Mr Saraki turns himself in and is charged, it would be another criminal charge since becoming Senate President in June 2015. He had been previously docked at the Code of Conduct Tribunal for false and anticipatory declaration of assets. He was discharged and acquitted on all 18 counts, but the Court of Appeal upheld all but two of the charges and returned them to the tribunal. Next articleJolly Nyame’s Conviction: Protest Rocks Taraba State.